Each track is to be driven by an AstroFlight Cobalt 40 motor. With enough nicad batteries the motors can put out close to 1 HP each, though they would need a substantial cooling system to run at that power level for more than a minute or so. The best total gear reduction is estimated at 16:1, though I wont know if that is the ideal ratio till the AAV can be driven about. Because the gear ratio might need to change, I have used worm gears and a chain and sprocket for reduction. 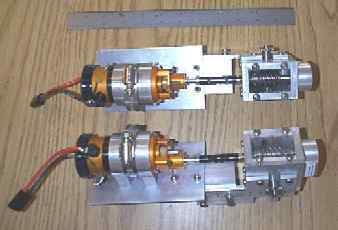 These two types of gearing allow the ratio to change without needing to change the distance between gear shaft centers (so no need to rebuild the gearboxes). 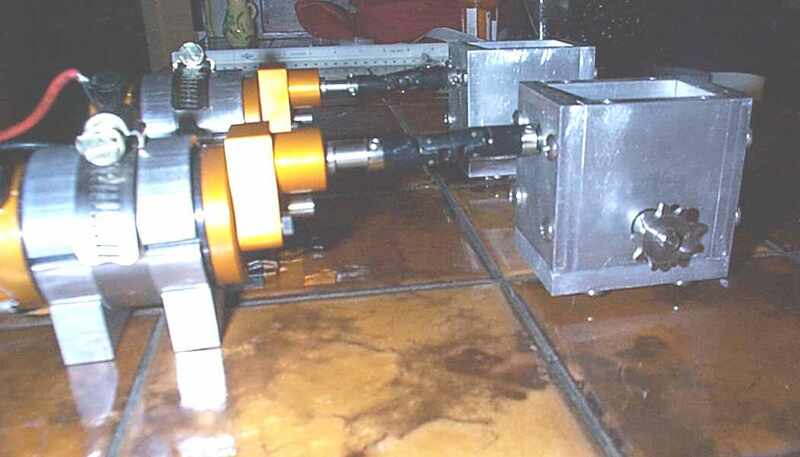 The photo below shows the 2 motors and the worm gear boxes. 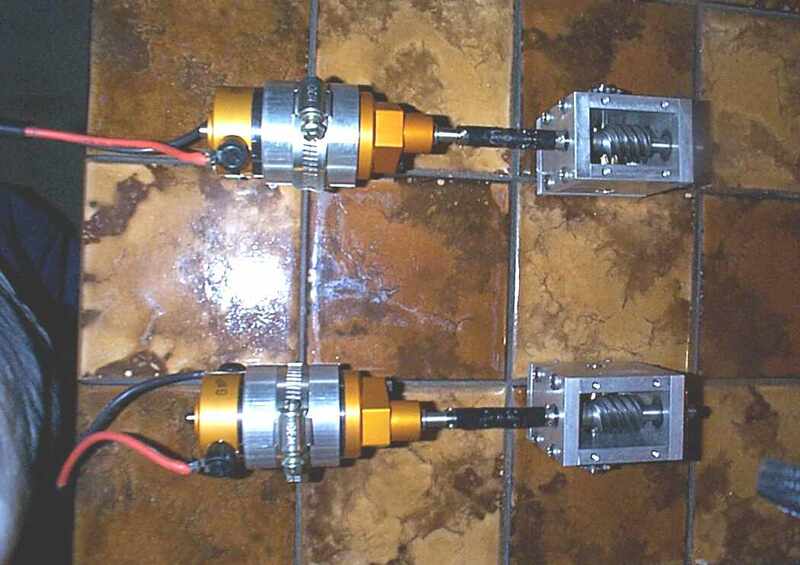 The motors come with integral 1.6:1 gear reducers, and the worm sets are 5:1. Available alternative worm/worm gear ratios are 10:1 and 20:1. Each gearbox has a recess in the bottom to act as an oil sump. 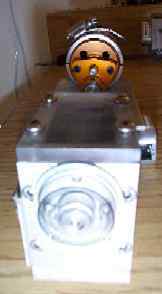 The worm gear protrudes into the oil sump area, so with a small quantity of light oil the box should get decent splash lubrication. Below is a side view that shows the sprocket on the output shaft. Note that the sprocket is held in place by a drive pin, and a snap ring (not visible from this side of the gear) to hold the gear against the drive pin. Unless you can reliably machine press fit tolerances, you need to use drive pins, woodruff keys, or set screws to hold gears on shafts. For high torque applications set screws are a bane, and I'm just learning how to cut keyways, so I chose drive pins. Also note in this photo the hand made motor mounts. When you buy the Astroflight motors with gear reducers, it is not possible to use the standard Astroflight motor mount. The mounts that I made are aluminum pipe slit down both sides, with the lower side welded to an aluminum block. The motor is clamped in place by tightening the radiator clamp. Below you can see an extra 1/4" shaft projecting from the far side of the gearbox. That is for an optical encoder wheel so that the onboard computer can determine motor rpms and direction. I'm hoping that having instant feedback on rpms will allow very smooth turning maneuvers as well as improved straight line tracking. You can see in this picture that both shafts are supported by cartridge ball bearings. The 1/4" pitch stainless drive chain and the sprocket for the final drive shaft are being held by a wannabe AAV driver. This chain is driven by the sprocket on the side of the worm gear box. The sprockets and chain provide another 2:1 speed reduction. There are several gear ratios available between 2:1 and 1:1 that can be accomodated by swapping sprockets and adding a link or two of chain. Below are the two track servo assemblies. Each motor has a centripetal cooling fan at the back end. 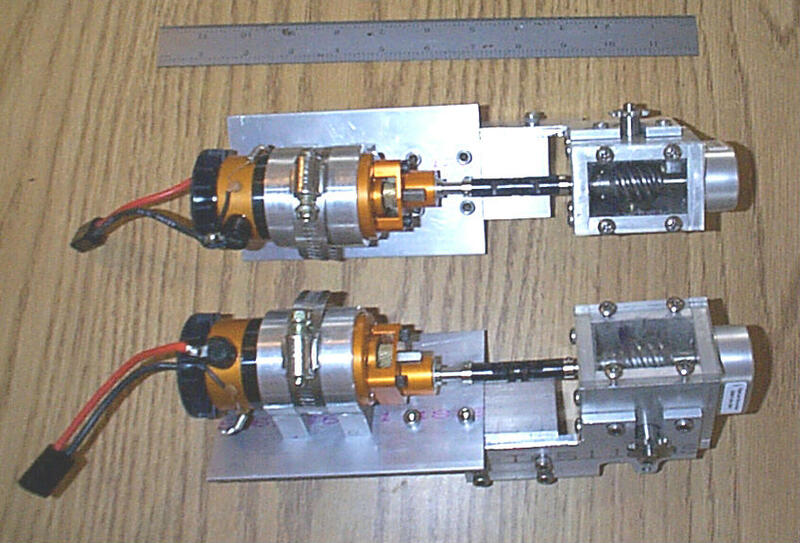 Each gearbox has a shaft encoder bolted onto the front end. Here is the side view. The drilled tab at the lower right mates with the interior bearing support for the final drive shaft, supporting the upper chain sprocket immediately above the lower chain sprocket (which drives the track sprocket). 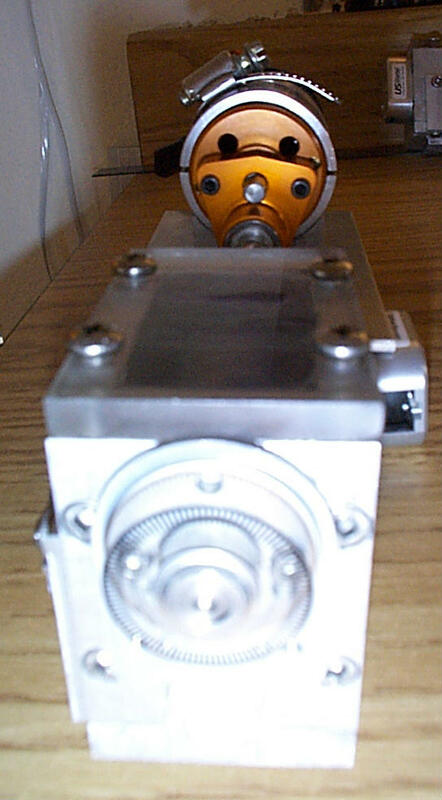 Here is a front view of the gear box, with the shaft encoder cover removed. The encoder wheel is a little blurry, but you can still make out the radial tick marks that are read by the LED/photransistor detector. Still to come: Final fit-up of the motors and gearboxes to the hull. This page was last updated on April 28, 2006.